Special knowledge about unique resilient products. If you’ve been through all the vinyl flooring sections and still haven’t found the product for you, maybe you require something more specialized. That’s why we created this section. Within it you’ll discover four different and distinct products that really are in a class by themselves. All are beautiful, stylish and have their own personality – to create a special feeling and atmosphere in your home. All are resilient floors, that means, as the name implies, they have some "give" or elasticity when you walk across them. We invite you to browse through these Specialty Products and, who knows, maybe there’s one here that will capture a special place in your heart. Linoleum: Today’s linoleum is a far cry from the flooring you crawled around on in your mother’s kitchen. It’s enjoying renewed popularity as a flooring choice because it is made of natural ingredients. So you may take a natural liking to it. These natural ingredients include linseed oil, cork, limestone, wood flour and tree resins. An advantage to you is the fact that the color in linoleum goes all the way through, making it extremely wearable and durable. Another reason for linoleum’s renaissance is that, while it normally comes in sheets, it can be hand-cut for intricate patterning and one-of-a-kind artistry. Thus it’s very customizable, giving you wide freedom to express yourself. Linoleum is a quiet, warm surface that cushions your feet and requires minimal maintenance, although it may scuff or mark if not kept well polished. Its main nemesis is dirt, grit or sand that can be ground into the surface. Utilize walk-off mats or rugs whenever possible. And sweep clean. Cork: for those who want to uncork something special. Beautiful and unique, warm and inviting, cork flooring commands attention, discussion and a typical question: what kind of floor is that? Read on and you can easily answer that question, and more; impress friends and neighbors alike. Cork is actually the bark of a tree commonly known as Cork Oak. Predominantly found in Portugal and Spain, Cork Oak is native to the Mediterranean region. The bark naturally splits every 9 to 15 years and can be safely harvested causing no harm to the tree. That’s good news for the environment. The bark re-grows and the cycle continues on for years and years. Some Cork Oak trees have been known to live up to 500 years. Cork flooring can be a viable alternative for any room in your home. It is a natural product, so even if finished in color or left natural, it will show variations in characteristics, tones and shades from tile to tile. Cork flooring is installed much like a hardwood floor in that, once installed, a urethane coating is applied. However, cork flooring is much warmer than wood as well as being durable and forgiving. 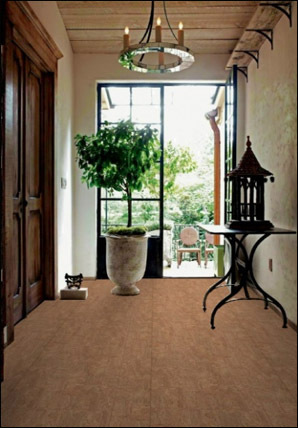 You should know that cork flooring is warm to walk on and extremely quiet with natural sound absorbing qualities. It’s also naturally hypoallergenic and naturally resistant to mold and mildew. Great advantages one and all. Maintaining a cork floor depends on the type of finish, but it is usually treated like wood, which means sweeping or vacuuming regularly to keep it grit-free. Wipe up spills promptly, and only use cleansers that are recommended by the flooring manufacturer. Cork flooring can be wiped with a barely damp cloth and towel-dried. Waxed cork needs occasional re-waxing and buffing to preserve its beauty. Rubber: allow us to bounce this knowledge off you. 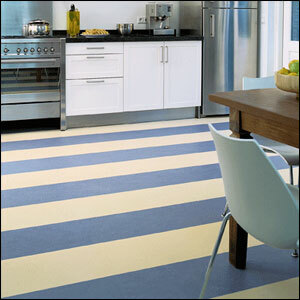 Today rubber flooring can be purchased in a wide array of handsome, clear colors to match your home and its personality. Stud rubber flooring is available in either sheet or tile form. Rubber floors offer you and your home a variety of benefits. Rubber flooring is extremely durable, virtually indestructible, quiet and warm to walk on. It is also very good at resisting dents and stains and its waterproof surface has an anti-slip finish. However, rubber is a relatively expensive flooring choice and must be installed by an experienced installer for maximum performance. But if it’s truly unique you’re after, and a sure-fire conversation starter, rubber flooring is an idea well worth bouncing around. Specialty Resilient: two great ideas in one floor. Recently, manufacturers have begun selling a new product that offers the benefits of resilient flooring with the look and feel of real ceramic tile or wood. Called specialty resilient, this flooring material is made of vinyl and aluminum oxide. The result is a lightweight, durable floor that creates less strain on your back and legs. And who wouldn’t appreciate that? Like resilient flooring, specialty resilient flooring is applied with a mastic over a sound subfloor. This product is available in residential grades and comes in many patterns and designs based on stone, granite, marble and exotic wood grains. Just imagine the possibilities in your home. Basic product sizes are 16" x 16" and 17" x 17". 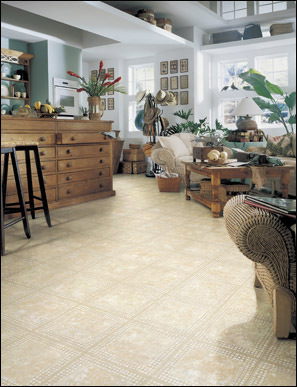 Certain types of specialty resilient flooring can even be grouted to virtually guarantee the ceramic tile look. Now you know about Specialty Products. One thing is certain, these flooring products are all very unique and definitely out of the mainstream. If that seems to describe you, your lifestyle and living space, welcome home.